This requires suitable organizational structures, modern learning architectures and interactive learning platforms, which enable the formation and strengthening of neural networks of your management. In order to successfully master the current challenges we present our concept NEXT-GEN Leadership. It is based on the findings of the Newer System Theory and the latest knowledge from the neuroscience. The starting point of the NGL concept is the view on organizations as complex social systems. As a result, the traditional assumption to causally explore and explain organizational phenomena is abandoned. Organizations are communication systems. The most important communicative event in these systems is the decision. Employees and managers are not part of the communication system, they are the so-called relevant environments. They act as players of a game who make an important contribution to the organizational communication. The game with its rules does also exist without its players. Nevertheless, only their participation – their communicative contribution – brings the game to life. The strong independent existence of organizations has a determining impact on managers and their behavior. If the collectively embedded expectations are not met (also) by the management, the reaction shown by the organization can be unexpected and very strong. In turn, this reaction impacts the management and its role definition. It is no longer about making own, right decisions but to ensure that all relevant information that is available inside and outside the organization is fed into the ongoing communication process, thus leading to smart decisions. Depending on how well designed this communication process is, it has an effect on the quality of the taken decision. Current neuroscience sees the human brain as a dynamic, self-organized super system, which consists of a variety of neurons (nerve cells). These neurons are closely linked to each other by synapses and form neural networks. The neural networks highly influence our mental processes: perceptions, actions, emotions and motivation. Contrary to previous assumptions, the brain has the ability to change and to learn throughout an individual's life course (neural plasticity).The brain is understood here as an organ that has a similar function as a muscle. Through the frequent activation of neural networks, i.e. by repeating certain perception, thinking and behavior patterns that are typical for the respective person, neural networks are strengthened throughout the life course. This increasingly leads to established paths, i.e. patterns of reaction and experience, which then run automatically and often are of unconscious character. Inversely, if a network is no longer used, it diminishes slowly and the person shows a certain behavior less frequently. During the learning process, new neural networks are formed according to this principle. The more frequently the new behavior is practiced, the stronger becomes the connection. The more seldom the behavior is practiced, the weaker the neural connections. This means that new neural networks result in changed behavior and experience. Neural networks play a significant role in successfully meeting the challenges ahead. The NGL concept uses the brain as a resource- and solution-oriented organ and builds on the current neuroscientific findings. Accordingly, it supports the personal development process for managers and future managers with regard to their current tasks. The brain has an assessment function and identifies behaviors that harm or benefit the psychobiological well-being. A distinction is made between cognitive (rational/ mind) and affective (emotional/ feeling) assessment systems. We can assume that all lived experiences (with situations or objects) as well as associated emotions and physical sensations are stored in the experience memory of the brain. In terms of affective assessment, the brain uses the stored experience to support a behavior that ensures the best possible psychobiological well-being. Therefore, the brain relies on stored experiences with situations and objects – the somatic markers. These markers react in milliseconds in the categories “good“ or “bad“ and lead to the corresponding feeling or physical sensation. We can thus sense positive and negative somatic markers. Within the framework of the NGL concept, we particularly use the positive somatic markers to form neural networks as these markers are associated with positive, affective reactions and pleasant physical reactions. Thus, we utilize those resources that the managers already have at their disposal in order to develop adequate behaviors, based on a self-determined attitude. The NGL concept is built on resource-oriented self-management. We assume that every person has at its disposal most of the resources that are necessary to successfully tackle present and future challenges. Here, we especially rely on the Zurich Resource Model (ZRM®) that has been developed by Dr. Maja Storch and Dr. Frank Krause. The ZRM® takes into account the latest neuroscientific knowledge and integrates the strengths of elaborated therapy methods. It concentrates on the available resources instead of processing problems and deficits and enables an above-average transfer efficiency. With the understanding of the Newer System Theory the determining forces of an organization that impact managers (and vice versa) are considered to an equal extent. Far-reaching changes and crises present companies and managers with challenging development needs. The volatility of relevant environments demands a quick and flexible reaction. Thereby, personnel and organizational learning should be closely interlinked. The NGL concept ensures that the leadership development doesn’t take place independent of organizational requirements and circumstances and without taking into consideration the relevant environments with the expected developments. 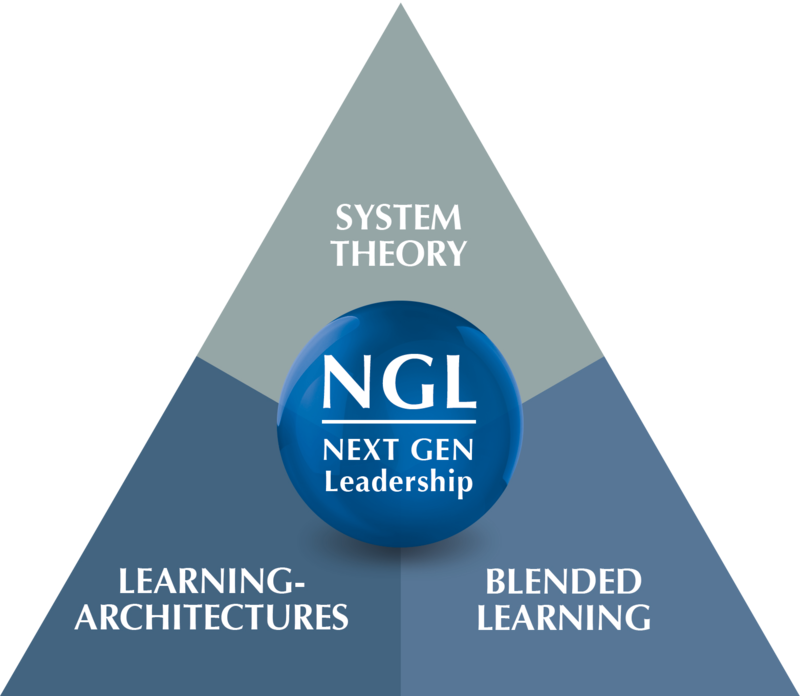 In the NGL concept, the close interlocking of organizational and personnel learning is ensured through modern learning architectures. The starting point for the leadership development is the question what organizational frameworks have to be established and what organizational development/change has to be initiated in order to sustainably secure the existence of the company. Based on these requirements, it is decided what consequences there are for the management of the respective company. A well-elaborated qualification architecture (personnel development) sets the pace for the processing architecture. Synchronously with the qualification phase, organizational frameworks are created to effectively interlink the learnt with the organizational development. This ensures transfer efficiency. If organizational development is the starting point, first, concrete requirements for development and change are identified at the organizational level. In the second step, the necessary processing architecture (organizational development) is derived. Finally, the question is answered what needs to be done in terms of qualification in order to successfully master the specific organizational challenges. If it becomes clear that there is a need for personnel development, the corresponding qualification architecture is designed and implemented. In this case, the processing architecture sets the pace for the personnel development. In each case, the NGL concept assures that knowledge is not accumulated and retained. Instead, leadership development is designed in a tailored and suitable way, matching the organizational challenges. Never before were there so many ways for organizational learning and development measures: ranging from interactive knowledge databases to mobile learning apps or activating workshops. However, media variety alone does not guarantee the success of your personnel development measures. Didactics and methodology, a comprehensive analysis of your learning needs, training content and target groups are still highly important. The method does not determine the content. The content determines the method. The implementation of an efficient learning architecture requires a resource-oriented Blended Learning design. An essential part of the learning architecture is the central learning platform that enables your team to use learning offers irrespective of time, location and device. The learning platform allows web-based self-study according to the perceived learning needs and at individual pace. Outside of the often narrow time windows in training seminars or workshops, your employees find the space to acquire and to train competences – tailored to their current professional challenges. Latest neuroscientific research results show that sustainable learning success strongly correlates with the degree of self-determination in the learning process. Meanwhile, learning progress in neurobiology can be visualized as neuroplastic changes in the brain. It can be demonstrated that learning progress is greater when the learner discovers the learning object and searches for solutions by himself/herself. Furthermore, the learning progress is positively influenced if the learning content is presented in a manifold way and can be explored in individual pathways of learning. Self-directed learning via a learning platform, supported by various digital learning materials – e-learnings, learning videos, simulations or interactive knowledge databases – offers high efficiency, not only from the economic point of view. However, studies show that personnel and self-directed learning processes that do not have any interlinking to the organizational challenges usually remain ineffective. Therefore, continuous assessment and reflection of the learning processes are of utmost importance. Innovative learning management systems enable a continuous assessment and automated learning success controls. Your employees get a clear feedback and a structure regarding their individual learning progress. Your personnel development department receives information regarding the acceptance of the available learning offers and have the possibility to modify and adjust those accordingly. The learning on a learning platform takes place mostly asynchronously. Although, digital communication channels support the exchange in the learning process and about the learning process on the platform, regular reflections are necessary for a joint assessment of the current position. This ensures the efficiency of the learning processes and supports the implementation of the learnt in the organization. Here, the appropriate methods remain face-to-face events and the personal exchange of your employees. With the asynchronous self-study using different learning media on the platform more time is created for the reflection, assessment, constructive discussions and decisions within conventional further on-site training measures. Through the targeted use of relevant learning materials, the participants have the possibility to prepare for workshops. At the same time, the platform can be used to delve further into the content subsequent to the workshop. In this way, the focus of face-to-face events can be put on communicative settings and methods for reflection and assessment of the personnel and organizational development. Thus, these events particularly serve to integrate different learning experiences in the organization and to improve learning processes. At the same time, the learning architecture demands the discussion of organizational changes and therefore the implementation of the learnt competences in the operational business. The didactic meaningful combination of traditional face-to-face events and modern forms of web-based learning on the platform combines the efficiency and flexibility of electronic learning methods with the social aspects of face-to-face communication and the practical training of competences and activities. By combining various media and methods, the Blended Learning design aims to reinforce the benefits and to minimize the disadvantages of those. It is particularly important that the attendance phases and self-directed learning phases are functionally matched. Through the smart connection of asynchronous learning phases on the platform and the joint reflection of the different learning processes in face-to-face events, conditions for an interlinkage of learning objectives and operational tasks are created within the learning architecture. In an ongoing, two-way development process an effective interlocking between organizational and personnel development takes place within the conceptual learning architecture. This ensures an efficient and synchronous further development at both Levels. Roth, G. (2003). Fühlen, Denken, Handeln. Wie das Gehirn unser Verhalten steuert. Suhrkamp: Frankfurt am Main. p. 150.